Strength Training Older Adults™ addresses the information and tools needed to educate, motivate, and assist older adults in committing to and benefiting from individualized strength training programs. Guidelines for senior strength training provide a basis for program design, and recommendations for program modifications that construct strength training programs that meet each client’s needs, abilities, and limitations. Illustrations and biomechanically sound instructions for exercises that use resistance machines, free weights, body weight, elastic bands, and balls present proper techniques with clear explanations. Unique teaching scripts offer strategies for communicating information that will help clients avoid errors that cause injury or reduce the effectiveness of the exercise. 1. Discuss the benefits of strength training for older adults. 2. 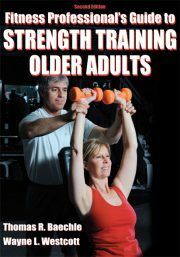 Explain and apply the training principles to designing safe and effective strength training programs for older adults. 3. Explain and apply exercise execution procedures and instruction to incorporate into safe and effective strength training programs for older adults. 4. Create a safe and effective basic strength training workout program appropriate for older adults. 5. Modify a basic strength training workout program for more intermediate and advanced older adults. 6. Identify and describe alternative exercises and programs, which are appropriate for strength training older adults. 7. Explain the exercise modifications that may be needed when strength training older adults with certain conditions. 8. Design sport-specific strength training programs for older adults. 9. Discuss the nutritional needs of older adult clients. Electronic Format – The Strength Training Older Adults™ certificate package with online test includes the eBook version of the 344-page Fitness Professional’s Guide to Strength Training Older Adults by Thomas R. Baechle and Wayne Westcott (accessed through Adobe Air with instructions for downloading Adobe Air*) and an 80-page workbook provided in PDF format. Instructions for completing the 60 question multiple-choice online test and obtaining CECs are also included in PDF format. Note: This course package is made available for immediate access and download after purchase. All materials for this electronic format course are available electronically. Nothing is mailed. *This e-book requires the installation of Adobe Digital Editions. For information about e-books and Adobe, click here and read the access instructions. Im glad that there were photos of exercises in the book, but a video would help with learning the technique and correct body positioning, its hard to tell all of that unless photo is shot at multiple angles. Again, if video demos of exercises were available, I was not aware of it. The study guide was very helpful in summarizing main points of each chapter. I took my time to study. 2017-09-24 14:22:17 NSCA, Spinning Agree Disagree Agree I train and teach older adults and will be able to better meet their needs.